PLEASE NOTE THAT THIS TRANSACTION CONSTITUTES A PRE-PAYMENT (NOT AN ORDER) FOR A VARSITY LETTER SWEATER. THE CUSTOM ORDER MUST BE PLACED DIRECTLY IN THE VIKING CORNER STORE SO THAT SIZE, COLOR, STITCHING DETAILS (GRADUATION YEAR AND NAME) AND CONTACT INFORMATION MAY BE CONFIRMED. 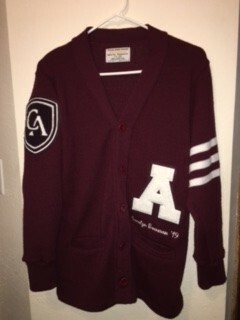 THE VARSITY LETTER MUST ALSO BE DELIVERED TO THE STORE, IDEALLY WHEN THE STUDENT RECIPIENT COMES TO DETERMINE SIZE. ANY CHAMPIONSHIP PATCHES WILL BE SEWN ON THE SWEATER FOR AN ADDITIONAL COST OF $6.00 PER PATCH WHICH CAN BE PAID ONLINE. PATCHES MUST BE DELIVERED TO THE STORE ALONG WITH THE VARSITY LETTER. ONCE THE VIKING CORNER HAS RECEIVED THE LETTER, CONFIRMED SIZE AND STITCHING DETAILS AND RECEIVED PAYMENT, A CUSTOM ORDER WILL BE PLACED. 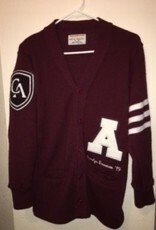 STANDARD VARSITY LETTER SWEATERS TYPICALLY TAKE 8-12 WEEKS FROM THE DATE OF IN-STORE ORDER PLACEMENT (NOT ONLINE PAYMENT) TO BE COMPLETED. THE VIKING CORNER WILL NOTIFY YOU ONCE THE JACKET IS COMPLETE AND READY FOR DELIVERY.